mandatory military service each year. Lithuania (set to be approved by parliament) and Ukraine (2014) are on the same track. I've never imagined myself as a military conscript until now. Wierd. I guess the whole spectre or war will become all too real. Anyone here who has been to bootcamp? concern that school lunches are a threat to national security. 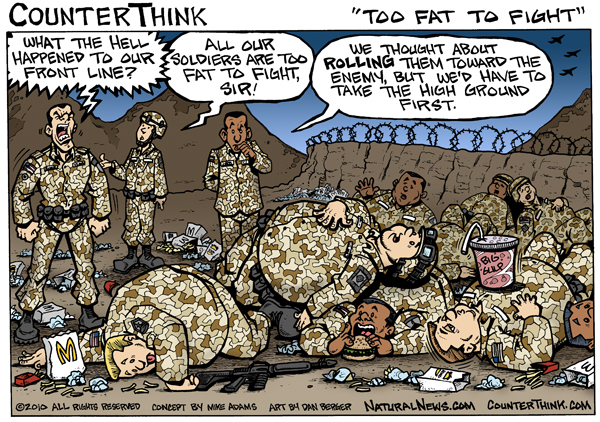 being fed to children at public schools is making them "too fat to fight", leaving a potentially considerable gap in military recruitment. Ffs. I knew it was only a matter of time before this started happening. Didn't think Swedes would be the first hit, and I thought WW3 would have been officially declared first. *sigh* dammit! I never understood how learning to kill people can instill positive values that are valuable to society into people. I mean sure you have a need for teamwork in the army, but you can learn teamwork from playing soccer too. Or something like that. If a draft should be installed, let people work in healthcare or some kind of humanitarian cause where they cease other's suffering instead of promote it through violence. The draft is one of the many reasons why I distrust the government, drafted people are basically the cannon fodder of the army and the nonsense reasons to draft people only show the incredible hypocrisy that drives society. 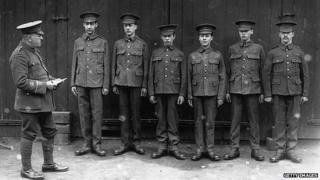 Some of the under-18s conscripted to fight in WW1 (except for the guy with the tauche). Some 250,000 ''served their country'', many never making it ou alive. In this case, the draft was instituted 2yrs before the war ended. Thy Unveiling wrote: Ffs. I knew it was only a matter of time before this started happening. Didn't think Swedes would be the first hit, and I thought WW3 would have been officially declared first. *sigh* dammit! Yeah I'm surprised it was Sweden. I'm surprised WW3 hasn't been officially declared yet. I knew it wouldn't have been long until this began happening. Didn't figure Swedes would be the main hit, and I figured WW3 would have been authoritatively announced first. *sigh* damn it!